A rooftop bar is a bar on the roof of a building, most commonly of a hotel. Imagine this: enjoying the sun with cold drinks and an unparalleled view of Manhattan. 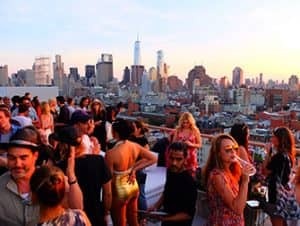 Or, alternatively, partying on a hot summer’s night with cocktails and the lights of New York surrounding you. Doesn’t that sound great? 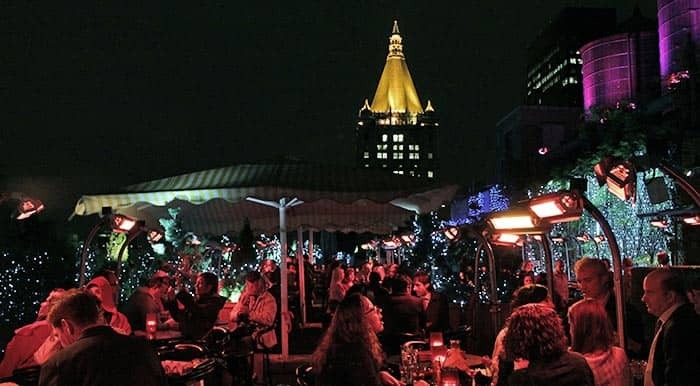 That’s exactly why this is a list of the best rooftop bars of New York! 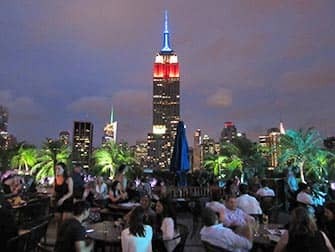 If you want to experience the best rooftop bars in New York for a great price, then I suggest taking the rooftop bar tour. 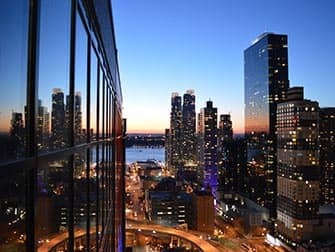 On this 3-hour tour you will visit 3 of New York’s best rooftop bars, perhaps including my favourites: Sky Room and 230 Fifth! You will be able to enjoy a few of New York’s hotspots and three drinks for only A$119! Note: This tour is available on Tuesdays, Wednesdays, Thursdays, Fridays and Saturdays and starts at 19:00. This means that between April and October you will have views of the sunset over Manhattan. 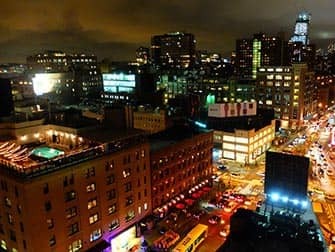 The Gansevoort Hotel is the place to go to for various occasions. If it’s been a long day and time to unwind with some drinks and snacks then this rooftop is certainly the place to be. On weekdays between 17:00 and 19:00 it’s happy hour, with a special menu with some bites and lower prices for alcoholic drinks. This rooftop bar is very popular, so make sure you have made a reservation if you want to visit during evenings or weekends. It’s also a great place to party in the weekend. 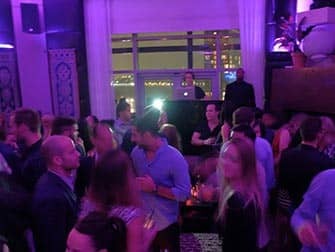 So if you feel like dancing and meeting people then the Gansevoort is definitely recommended. The first room is primarily for talking and is the perfect place to meet (new) people. In the other room there is a DJ playing music all night – the later it gets, the wilder the party. 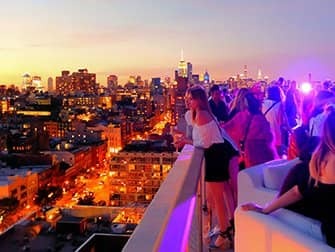 When on the rooftop, first enjoy the panoramic view before you order a cocktail and then head over to the dance floor to boogie and meet people. Seeing as the hotel is very popular, take into account that you might have to queue up to enter. If you go before 23:00 then there will be hardly a queue. Between 23:00 and midnight it gets busy and around 01:00 you can expect a long queue. Here too you’ll need to dress neatly to enter, with a shirt and dress shoes for the men and neat clothes for the women (no sandals). During the day you might be able to get into the lounge club without a passport, or if underage, but after 19:00 this won’t be possible. There is also a swimming pool on the roof opened during the day for hotel guests. 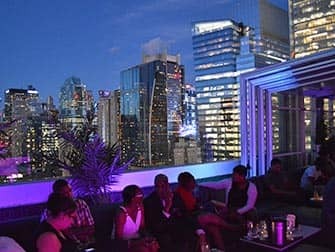 The Roof at hotel PUBLIC is one of New York City’s newest rooftop bars and also boasts one of the best views. 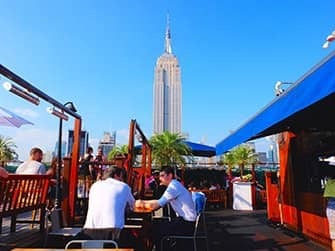 Located in the Lower East Side, it is currently the only rooftop bar in the area. The views over Downtown and Midtown are, therefore, also unique. 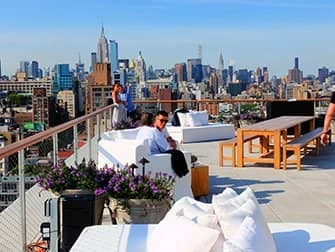 The Roof comprises of two terraces and a covered bar, and offers a 360 degree panorama over New York. From here, you can see all the tall Manhattan buildings, including the Empire State Building and One World Trade Center. This view makes watching the sunset from The Roof phenomenal. Between 17:00 and 19:00 you can get in pretty easily, without having to comply with strict dress codes. But as it’s one of the city’s hippest hot spots, later in the evening and especially the weekends, there are much stricter door regulations. When you enter hotel PUBLIC don’t take the very obvious escalator to the upper levels. Head instead to the lifts behind and they will take you up to The Roof. This is part of a relatively new hotel. This hotel actually has two rooftops. The first is called the ‘garden’ and is located on the 2nd floor where a garden has been built which is very spectacular. It is a great place to enjoy lunch when the weather is nice and then stick around for a bottle of wine. The real rooftop is naturally located all the way at the top of the hotel. You have to take the stairs and a lift to get there. The rooftop is small, but very beautiful with a terrace (including a swimming pool) and an indoor bar. It is chic and hip without having an arrogant vibe. Dress neatly and always bring your passport. Entrance only from 21 onwards. The Top of the Standard is one of the hippest clubs in the world (at least they like to think so). When you arrive upstairs you will need to hang your coat before you are escorted to your table by one of the waitresses who are aspiring models/actresses. If they think you are cool enough you will be seated in a beautiful place. You won’t know where to look in the beginning: at the spectacular interior or the splendid view. There is also an outside bar in the summer. Do you feel like dancing? Head over to Le Bain on the other side of the lift. Tip: Go ahead and use the bathroom, it’s certainly peeing in style! Ideal for impressing your friends. It is also nice for taking a break if you are shopping with your friend in the Meatpacking district. On Friday and Saturday it’s very hard to get in, especially if you are a man alone. Up until 17:00 it’s easy to get in if you are 21 and dressed neatly. The club is very exclusive and there is a good chance that you might run into someone famous. When you enter, walk all the way to the back where you can take a lift to the top floor. The lift opens on the Penthouse Lounge, a very large (fits 600 people) lounge that looks hip and trendy. 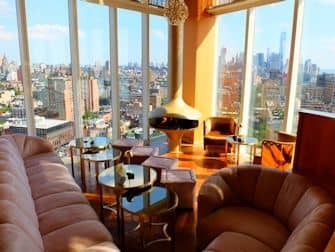 The entire lounge is fitted with windows which gives you a spectacular view of Manhattan. The lounge is open all year round from 16:00 to 04:00. After seeing this amazing lounge, go upstairs to the Rooftop Garden. You won’t know where to look! You’ll see an amazing view of Manhattan (with among others the Empire State Building and the Chrysler Building). On the other side of the rooftop, you’ll see Downtown and the Freedom Tower. If it’s a clear day you might even see the Statue of Liberty. The Rooftop Garden is huge and has an amazing atmosphere. Tip: If you are cold, you can ask one of the waiters for a bathrobe. Ideal for relaxing after an exhausting and tough day. You can also enjoy brunch, lunch and dinner here for a regular price. In the weekend it can get very busy and there will be queues in front of the door, especially after 23:00. Those under 21 will not be allowed in, not even at 16:00. Dress neatly, always with a shirt and dress shoes. In the middle of Manhattan, close to Times Square, you will find Sky Room. This bar is located on the 33rd and 34th floor of the Fairfield Inn and Suites Hotel. You just know that the view of Midtown will be great here, with the highlights being the Hudson River and the Empire State Building. Even so, it’s less touristy here than, for instance, 230 Fifth. The nice thing is that this rooftop bar actually consists of several bars, which are located at different ‘levels’. There are indoor and outdoor spaces, including a ‘cube’ that serves as a smoking area. It’s fun to wander around a bit because from each level, you’ll have a different view. The interior is modern and the public is hip (the dressed up kind of people). Are you a woman? Wear your high heels, otherwise you’ll be underdressed. Despite the strict dress code, the atmosphere here is very cozy. In that respect it is a really good place to get a beer. 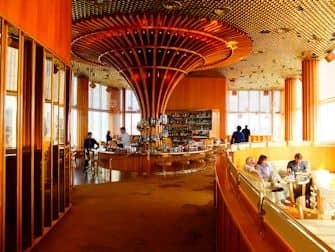 If you have the chance, go to Sky Room on a weekday from 17:00 to 19:00. Why? Because it’s happy hour then! For beer you only pay five dollars, mixed drinks and wine are seven dollars. There are also snacks like pizza or calamari, which are marked down from twelve to eight or even five dollars. Ideal for: getting a first impression of the city, while having relatively cheap drinks during happy hour. Without proper, decent clothing or passport it’s difficult to get in.